The latest annual Global Salary Survey from Robert Walters has revealed positive job market for technology specialists, digital marketers, regulatory and compliance project professionals, and skilled contractors in 2017. 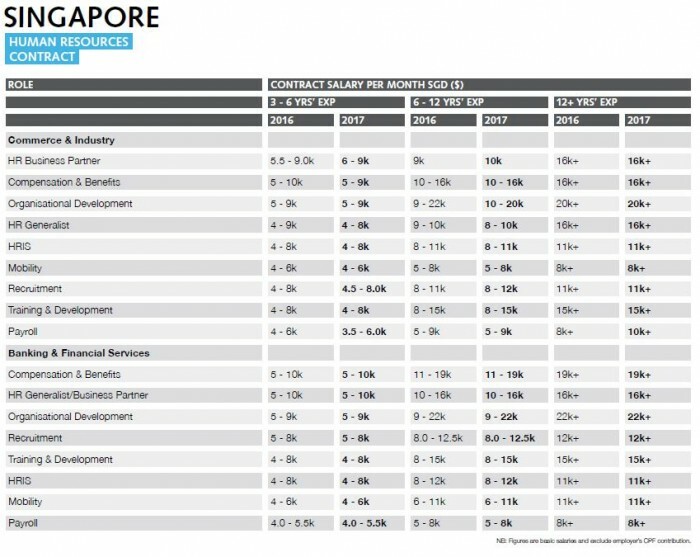 This demand will be driven by an increase in multinationals and startups establishing operations in Singapore. The survey also reported that while salaries are broadly expected to remain the same across all industries for 2017, candidates with in-demand experience and skills can anticipate an average salary increment of 10% to 20% when switching jobs. 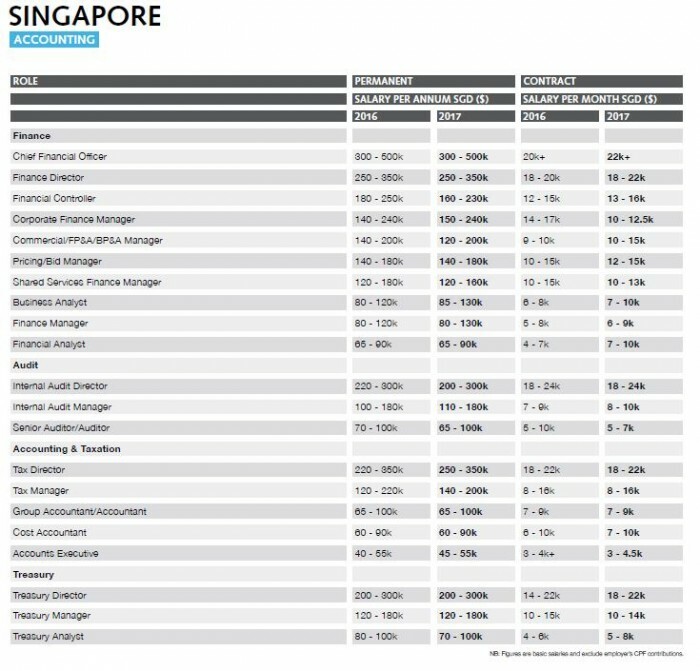 Toby Fowlston, managing director of Robert Walters Southeast Asia, commented: “Even with the global economic and political uncertainty, Singapore will experience moderate levels of recruitment in 2017. “Due to talent shortages for specialist roles, companies need to have an efficient recruitment process and widen their options by considering high-potential candidates with transferrable skills to fill certain roles. We also anticipate a continual demand for both domestic and overseas returning Singaporean talent,” he added. Strong hiring activity in the technology and e-commerce field, especially for user experience and user interface designers, and cybersecurity professionals. 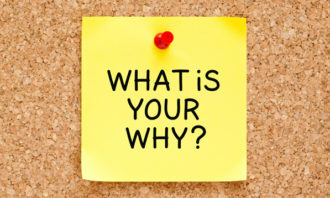 As employers focus on staff retention, strong recruitment demand is anticipated for roles in talent management, leadership & development and compensation & benefits. Rising demand for quality sales people and digital marketing candidates across all sectors. In the accounting and finance market, tax, treasury and internal audit professionals will be highly sought after, leading to higher salaries for job movers. 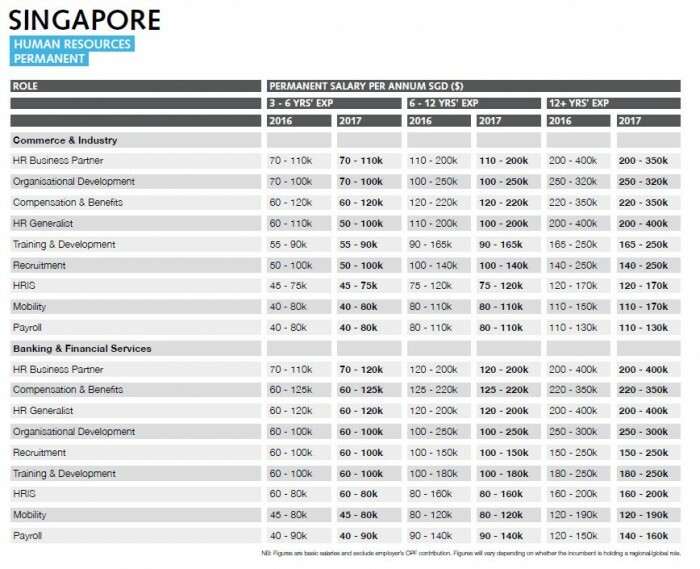 Salary expectation: Salaries are expected to remain stable, with experienced HRBPs at S$350k per annum. 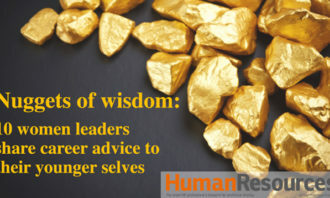 With the job market for permanent HR professionals in junior to mid-level roles being positive last year, many firms focused on retaining staff and improving talent management strategy. This drove an increasing demand for roles in talent management, leadership & development and compensation & benefits, and the survey foresees this trend continuing in 2017. The report also found that employers will be looking to hire talent managers with strong analytical skills and regional experience in 2017. SMEs will value hybrid candidates who can think strategically and provide hands-on support. In addition, learning and development professionals with strong digital experience will be in demand to revamp and improve the digital capabilities of organisations. Additionally, compensation and benefits candidates will be in strong demand, in particular benefits specialists with strong regional knowledge – especially of the Greater China region. When it comes to salaries and promotions, internal promotions for senior roles will be favoured over external hires as companies face budget restraints and the need to streamline their HR teams. 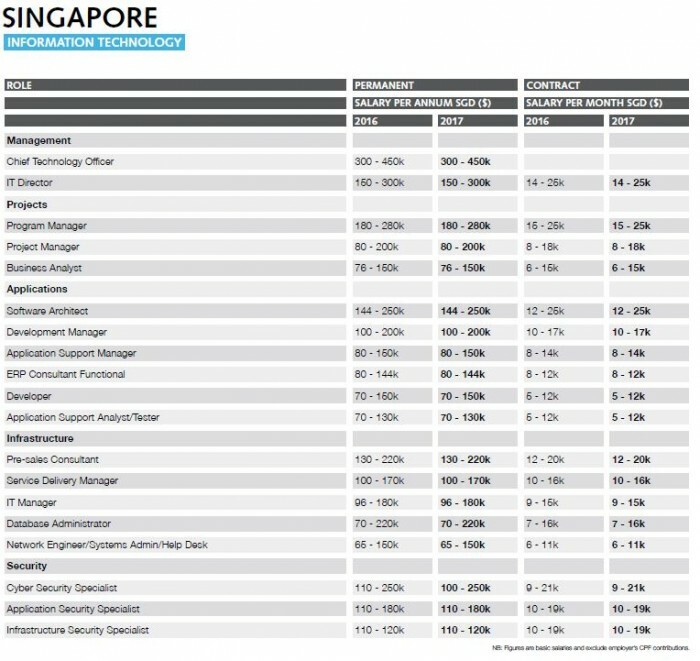 Salary expectation: Increment will be minimal, with in-demand cyber security specialists earning up to $250k per annum. As firms shift from traditional retail to e-commerce and leveraging technology to digitise, automate and streamline processes; this drives a very high demand for technology professionals with experience in developing the latest technologies and platforms. However, some companies are moving enterprise application operations from Singapore to lower-cost locations like India and China. As a result, experienced IT professionals will start assuming more functional, business-facing roles to avoid being replaced by lower cost talent in developing countries. Although the IT job market seems to be moving toward a positive outlook, salary increment is expected to be minimal. Nandita Nandakumar, senior manager (tech) at Robert Walters highlights how this may be due to the growing trend of start-up companies. “Start-ups are employing individuals who were formally from MNCs. While the salary is not much, they’re offering stocks, and this translates into the future. Those kind of creative packages are coming up and these professionals are willing to accept because they believe in the brand and the work they’ll do,” she said. Salary expectation: 10% – 15% increment, with experienced marketing directors taking home $240k per annum. 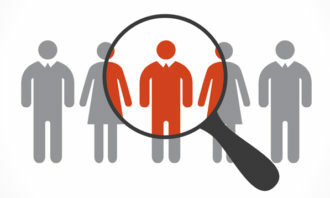 The report stated found that marketing hiring was dominated by a need for professionals with digital skills last year. Foreseeing a similar trend in 2017, there will be a rising demand for quality sales people as well as digital marketing candidates across all sectors. 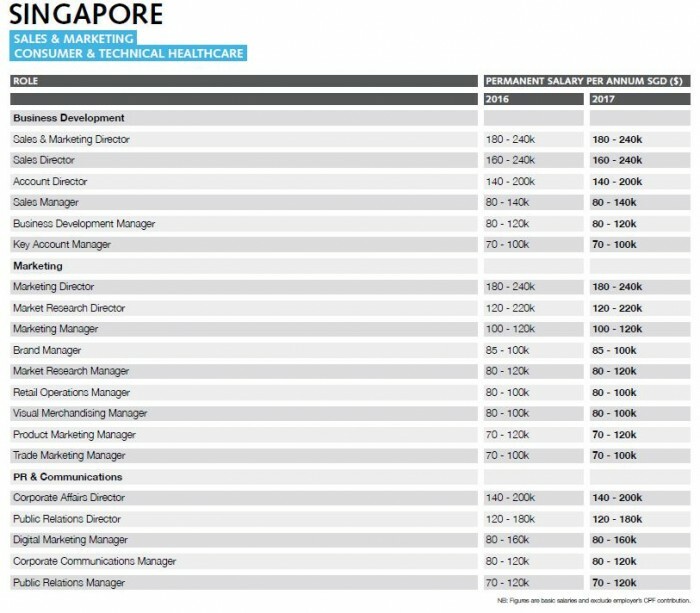 Additionally, the job market for sales roles remained healthy in 2016 with replacement positions driving Singapore activity in the retail sector. There was strong demand for talented corporate sales candidates in the services sector. Salary expectation: To remain competitive, with experienced CFOs earning up to $500k per annum. While the survey foresees a reduced demand across oil and gas, the demand for local finance professionals will continue across other sectors following the implementation of the Fair Consideration Framework. Finance professionals with strong communication skills and stakeholder management capabilities who can assume key business partner roles will also be favoured. In addition, roles in tax, transfer pricing, costing, consolidations, financial planning and analysis will be in demand but challenging to fill because of candidate shortages in these areas. 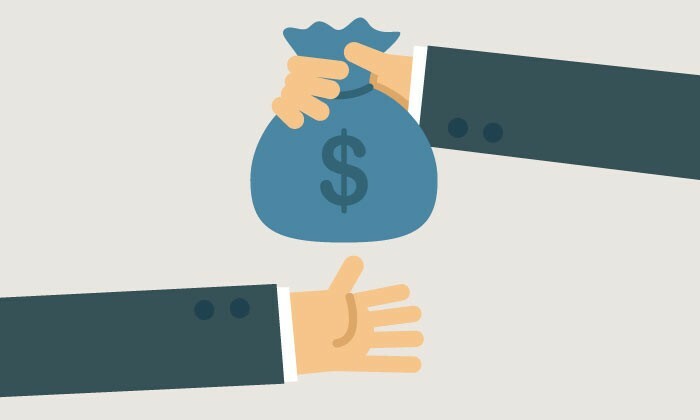 Due to the niche skill sets required for tax, treasury and internal audit roles, those looking to move jobs can expect higher salaries in 2017. 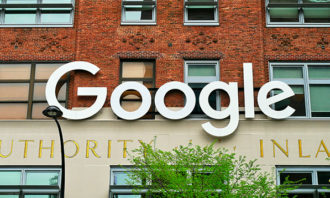 Oracle fires 200 staff, accused of "pleasing Trump"
Larry Page stuns the tech world with the setting up of Alphabet as Google's parent company, and an internal successor as new Googl..